Uplifting and strengthening, precious and soft – these are the incredible tones of our Premium Gift Set Myrrh. Part of the Parks Premium Gift Set Collection, this set of four votive candles and a scented diffuser creates a harmonious atmosphere. With inviting and warming oils of myrrh, blended with delicate cedarwood and fresh clary sage, this premium gift set is ideal for beloved friends and family. Transform the homes of your friends and family with this wonderfully warming gift set. Deep and rich, luxurious yet gentle, this combination of myrrh, cedarwood and sage works in perfect harmony for a memorable gift. Whether you want to say thank you, sorry, happy birthday or anything else, our Premium Gift Set Myrrh 3 Votive Candles & Diffuser is the perfect choice. Myrrh has been used throughout history as a perfume, incense, and medicine, and is a scent always in fashion. Supplied in a luxury presentation box, each candle has an average burning time of eight hours – providing long-lasting joy in the homes of friends and family. Talented craftsmen have used the purest natural wax candle and, we’re sure you’ll agree, the results are divine. Our clean-burning aromatherapy candles, room sprays and diffusers are designed and created with generous amounts of precious essential oils for a long-lasting fragrance to transform every home. 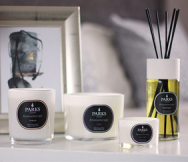 If you’re looking for a gift for that someone special, it’s got to be a luxury diffuser and candle set from Parks London.